When in the Course of human events did it become necessary for you to last think about VHS? 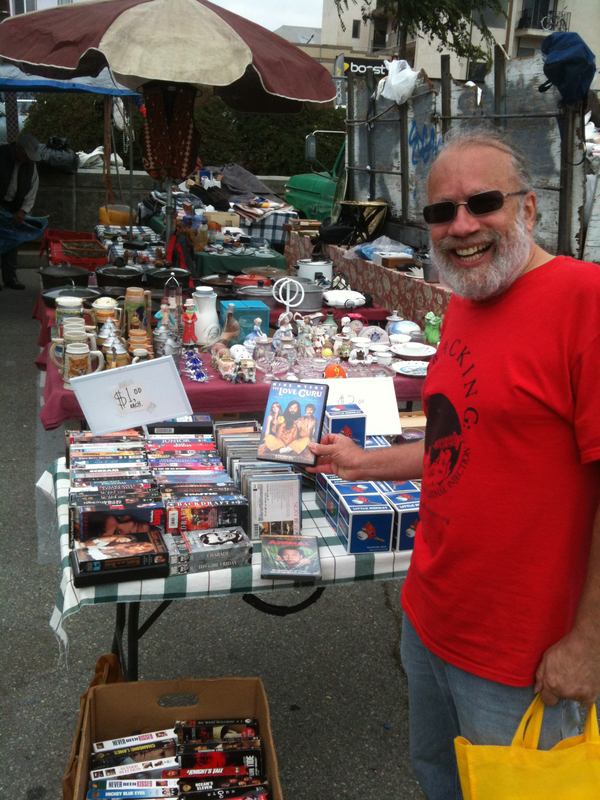 Maybe it was at the Berkeley Flea Market, when you stumbled on that incredible $1.00 bargain bin of magnetic media ‘rust-soup’ riches. Perhaps cleaning out your parents’ attic, as you neatly pocketed a quick $0.25 per title by unloading tapes to a used bookstore chain like Tennessee’s McKay’s or the Texan Half Price Books. Or, say, on vacation in Mexico at any number of bootleg puestos hawking ‘CLON’ DVD-R rips of out-of-print and New Release titles. 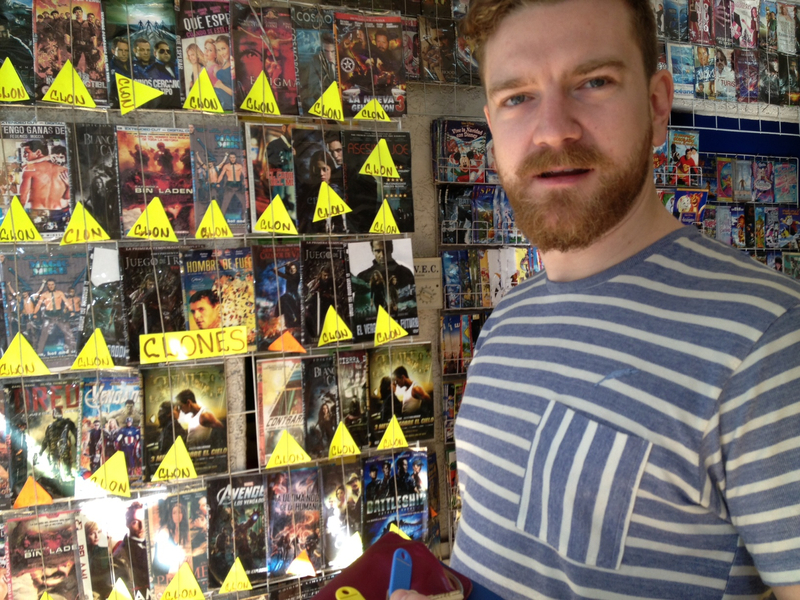 The author searching for new, unused, replacement copies in Mérida. Howard Besser: media preservation professor and Love Guru. For circulating media collections staffers at libraries VHS may be thought about less infrequently. There, contemplating VHS is less an act of consumptive capitalist curiosity than one of apocalyptic denial and/or, intractable procrastination. The fact is that the circulating VHS holdings of most larger, university, and research-scale libraries still give DVD holdings a run for their money in terms of size and annual checkout counts. As an example: New York University’s Avery Fisher Center collection contains about 15,000 VHS titles and 27,000 DVDs. 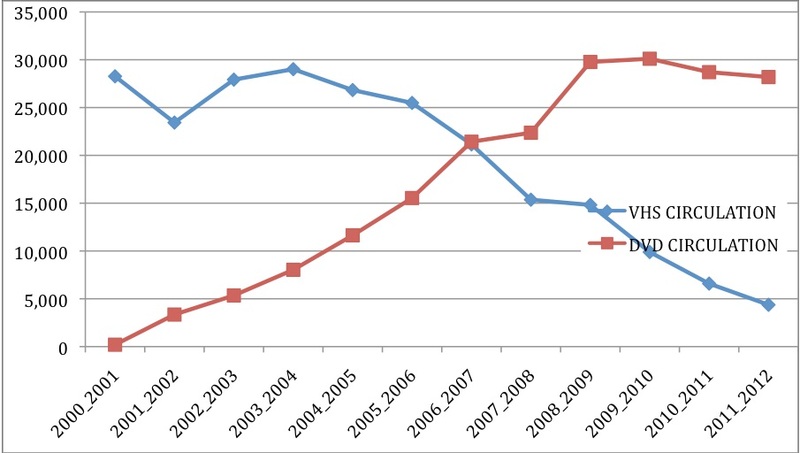 Circulation for VHS titles in 2011-2012 numbered 4,371. Students, professors, and researchers are still rampantly watching content on VHS despite the fact that the format is no longer manufactured or commercially used as a means of distribution, and that no new standalone VCRs are being manufactured. Such has been the patient sufferance of circulating video in libraries; and such is now the necessity which constrains them to alter their former Systems of Government. The truths should be self-evident that such hitherto practices are unsustainable, unproductive, unacceptable, uncool. These practices persist because authorized replacements for content originally held, and acquired, on VHS, are unavailable on subsequent formats. As both a matter of practical facility and law-abiding best practice, media librarians will prefer to purchase replacements than to create their own. However, as research conducted through the Andrew W. Mellon Foundation-funded project, Video At Risk: Strategies for Preserving Circulating Video Collections in Libraries, reveals, among the VHS titles WorldCat databases indicate NYU-Libraries holds the exclusive institutional copy of, over 1/3 are unavailable for replacement in the commercial marketplace. 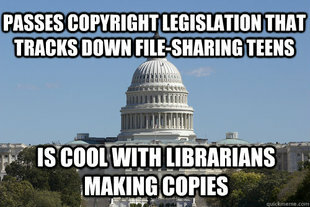 The history of the present fear of unauthorized digitization is a history of repeated timidity, ignorance, and neglect, all having in direct causality the Tyrannical unwillingness to invoke lawful rights granted to these collections of material by the United States Copyright Act. To rectify this, let Facts be submitted to a candid world about the lawful rights of libraries and archives to make copies of their commercially produced VHS videotapes. So, go ahead and make the effort to look for an “unused” replacement. Thou shalt document thine search for posterity. A used copy is not unused and, thus, does not qualify as an “unused replacement.” A different edited version, new restoration, CGI-revamped director’s cut, limited-time-only stream, or a region-restricted bootleg VCD from Turkmenistan could all be good examples of options that fall short of qualifying as a functional “replacement” for your VHS tape. Libraries probably already have a good sense of where they would normally look for a replacement, and those outlets—likely, various nationalized Amazon domain names (eg, “.com”; “.ca”; “.co.uk”), A/V community list-servs, and a healthy search engine foray—will be considered as constituting a “reasonable effort.” All the more so, if well-documented with notes on search-time exerted per title, and in compliance with some kind of formally written institutional replacement search policy statement. [NB: Hey! Maybe get to work on a one-page formally written replacement search policy statement for your institution?] Checking with online Secretary of State business registries for addresses as to the whereabouts of disappeared original distributors, along with a letter of inquiry for replacement copy availability, can only stoke the friendliness quotient of your annual eggnog-y Christmas Party conversation with your institution’s legal counsel. Determine what a “fair price” is for your institution. Maybe $300 for a 10-minute video art DVD replacement copy isn’t a “fair price.” And, unlike the universe of Kenner-brand original Star Wars figurines, the collector’s-item dollar value that a scarce, unopened video replacement may have accrued isn’t necessarily going to be “fair.” Copyright case law on the books even says so. Let’s skip ahead a bit, to the point where you’ve made your digital copy (**record scratch**). Don’t worry, we’ll come back to the digitization process. But with digital copy figuratively in hand, you’ll want to be careful to not run afoul of making it available to the public outside the premises of the library. Because U.S. Copyright Law was written in the twentieth century, this stricture is a little hazy and contentious in-practice, so I will refer you to the series of detailed, easy-to-use, “Copyright Guidelines,” which the Video At Risk project has recently released. They can best answer specific questions related to policy-making at your institution. The technical specs are a subject too lengthy to go in to detail in this post, so Video At Risk is currently revising drafts of a technical guide to digitizing analog videotape, to be made available to the wider library community this summer. Whether the decision is made to work with a third-party vendor (as libraries often do), or to build the capacity for videotape reformatting in-house (a more cost-efficient, yet expertise- and labor-reliant option IU and many of my fellow bloggers’ institutions have undertaken), the time to do it is definitely now.